Streamline scan-intensive data applications with the Symbol MT2000 Series. Combining the simplicity of a scanner with the intelligence of a mobile computer, these handheld mobile terminals provide advanced 1D/2D barcode, DPM and image capture, as well as the ability to key in and view data. 802.11a/b/g, Bluetooth, corded and batch connectivity options provide the flexibility to meet a wide range of business needs, and the ergonomic yet rugged design offers comfortable, reliable operation throughout your environment. Built on the .Net platform for easy application development, the MT2000 Series also comes pre-loaded with inventory software and an MCL client to facilitate porting of legacy applications. USB Cradle Kit. 2D Imager, Standard range, Bluetooth, Color Screen, Alphanumeric Keypad, Windows CE 5.0. 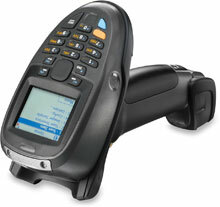 Includes charging/Bluetooth Communications cradle, power supply, US line cord, and USB cable. For Quad charging cradle kit see (Part# KT-STB2000-C4US). Batch, 1D Laser Scanner, Windows CE 5.0, Bluetooth, Color Display, Numeric Keypad. Interface cables and charging cradle sold separately. For the full kit see (Part# KT-2070-ML2000C14W). For Single slot Bluetooth charging cradle see (Part# STB2078-C10007WR) for power supply see (Part# PWR-BGA12V50W0WW) and for ac line cord see (Part# 23844-00-00R). For Quad charging cradle kit see (Part# KT-STB2000-C4US). SCANNER ONLY. 2D Imager, Bluetooth, Windows CE 5.0, Color Display, Numeric Keypad, MCL compatible. Does not include necessary cables or accessories. For the full kit see (Part# KT-2070-SD2078C14W). For Single slot bluetooth charging cradle see (Part# STB2078-C10007WR) for power supply see (Part# PWR-BGA12V50W0WW) and for ac line cord see (Part# 23844-00-00R). For Quad charging cradle kit see (Part# KT-STB2000-C4US). Starter Kit Bundle That Includes the PDT - 1D Laser Scanner, Windows CE 5.0, Bluetooth, Color Display, Numeric Keypad. Kit includes USB cable, Bluetooth/Charging Cradle, Power Supply, and US Line Cord. For Quad charging cradle kit see (Part# KT-STB2000-C4US). USB Non-Communication Cradle Kit. 1D Laser Scanner, Bluetooth, Windows CE 5.0, Alphanumeric Keypad, Color Screen. Includes charging/active sync (non-Bluetooth) cradle, power supply, US line cord, and USB cable. For Quad charging cradle kit see (Part# KT-STB2000-C4US). Wi-Fi (802.11a/b/g), 2D Imager Scanner, Windows CE 5.0, Bluetooth, Color Display, Numeric Keypad. Interface cables and charging cradle sold separately. For the full kit see (Part# KT-2090-SD2000C14W). Interface cables and charging cradles sold separately. Single slot Bluetooth charging cradle (Part# STB2078-C10007WR) requires power supply (Part# PWR-BGA12V50W0WW) and AC Line cord (Part# 23844-00-00R). Quad charging cradle kit (Part# KT-STB2000-C4US). Wi-Fi (802.11a/b/g), 1D Laser Scanner, Windows CE 5.0, Bluetooth, Color Display, Numeric Keypad. Interface cables and charging cradle sold separately. For the full kit see (Part# KT-2090-ML2000C14W). Interface cables and charging cradles sold separately. Single slot Bluetooth charging cradle (Part# STB2078-C10007WR) requires power supply (Part# PWR-BGA12V50W0WW) and AC Line cord (Part# 23844-00-00R). Quad charging cradle kit (Part# KT-STB2000-C4US). SCANNER ONLY. 2D Imager, High-Density, Windows CE 5.0, Color Display, Numeric Keypad, MCL compatible. Does not include necessary cables or accessories. Use either RS-232 cable (Part# CBA-R12-S07PAR) or USB cable (Part# CBA-U12-S07PAR) plus 12v PS (Part# PWRS-14000-148R) for tethered mode for this configuration. Starter Kit Bundle That Includes the PDT and Charge Only Cradle - Wi-Fi (802.11a/b/g), 1D Laser Scanner, Windows CE 5.0, Bluetooth, Color Display, Numeric Keypad. Kit includes USB cable, Charge Only (non-communications) Cradle, Power supply, and US Line Cord. Non-Bluetooth Cradle Kit. 2D Imager, Standard Range, Blutooth, Color Screen, Alphanumeric Keypad, Windows CE 5.0. Includes charging/active sync (non-Blutooth) cradle, power supply, US line cord, and USB cable. For Quad charging cradle kit see (Part# KT-STB2000-C4US). SCANNER ONLY. 1D Laser Scanner, WiF/Bluetooth, Windows CE 5.0, Color Display, Numeric Keypad. For the full kit see (Part# KT-2090-SL2000C1US). Interface cables and charging cradles sold separately. Single slot Bluetooth charging cradle (Part# STB2078-C10007WR) requires power supply (Part# PWR-BGA12V50W0WW) and AC Line cord (Part# 23844-00-00R). Quad charging cradle kit (Part# KT-STB2000-C4US). Sr Imager Ce 320x240/21-Key/Blk/Ww. Interface cables and charging cradles sold separately. Single slot Bluetooth charging cradle (Part# STB2078-C10007WR) requires power supply (Part# PWR-BGA12V50W0WW) and AC Line cord (Part# 23844-00-00R). Quad charging cradle kit (Part# KT-STB2000-C4US). SCANNER ONLY. 1D Laser Scanner, Windows CE 5.0, WiFi/Bluetooth, Color Display, Numeric Keypad, MCL Capable. Interface cables and charging cradles sold separately. Single slot Bluetooth charging cradle (Part# STB2078-C10007WR) requires power supply (Part# PWR-BGA12V50W0WW) and AC Line cord (Part# 23844-00-00R). Quad charging cradle kit (Part# KT-STB2000-C4US). SCANNER ONLY. 2D Imager, High-Density, WiFi/Bluetooth, Windows CE 5.0, Color Screen, Numeric Keypad. Interface cables and charging cradles sold separately. Single slot Bluetooth charging cradle (Part# STB2078-C10007WR) requires power supply (Part# PWR-BGA12V50W0WW) and AC Line cord (Part# 23844-00-00R). Quad charging cradle kit (Part# KT-STB2000-C4US). SCANNER ONLY. 2D Imager, WiFi/Bluetooth interfaces, Direct Part Mark (DPM) capable, Windows CE 5.0, Color Display, Numeric Keypad. Interface cables and charging cradles sold separately. Single slot Bluetooth charging cradle (Part# STB2078-C10007WR) requires power supply (Part# PWR-BGA12V50W0WW) and AC Line cord (Part# 23844-00-00R). Quad charging cradle kit (Part# KT-STB2000-C4US). By Tech in the house, warehouse that is! Product used for Newsprint Incoming inventory. Though the guns are extremely useful, especially the cradle to scan gun Bluetooth connectivity, we received a lemon gun that has been sent twice for repair. I'm hoping the replace the unit! Barcode dropout time has the ability to be changed in options, but anytime I try to change the time it goes back to the 2ms it was before. The distance I can scan a barcode from is probably a settings issue, but I have yet to find a setting for it. Pretty decent; feature rich. Haven't had much time to use it yet, but should do as described. Universal Battery Charger 4-Slot Base. Includes power supply and and DC line cord. Order 3 wire grounded AC Line Cord separately (Part# 23844-00-00R).